Red Sky: On special occasion, I like to dine under the stars. 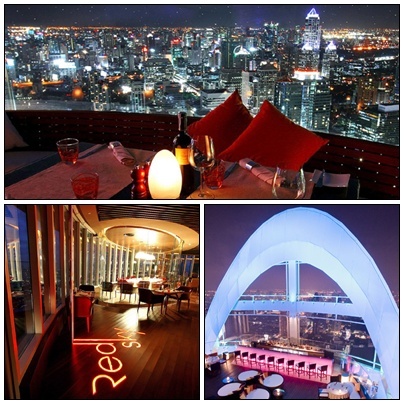 Red Sky is the rooftop bar on 55th floor of Centara Grand at Central World Hotel. What I like the most about this place is the breathtaking view. You can see the whole city center of Bangkok from there. The Red Sky is also very trendy, from their choice of furniture to the interior design, and it is also well-known for their delectable cuisine prepared by Chef De Cuisine Mikko Kataja who is world-renowned chef, you will not be disappointed trust me. Oh! and the music is good too; they have a DJ playing top chart music. 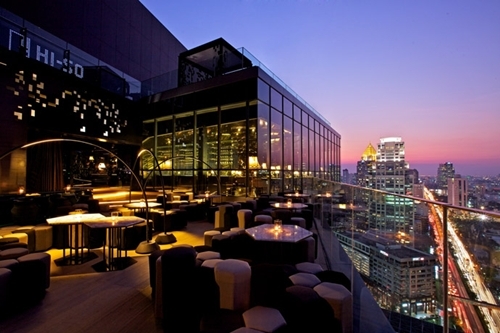 Park Society: Located on the 29th floor of the new Sofitel So Bangkok hotel on North Sathorn road. I like everything here from first step to my last. 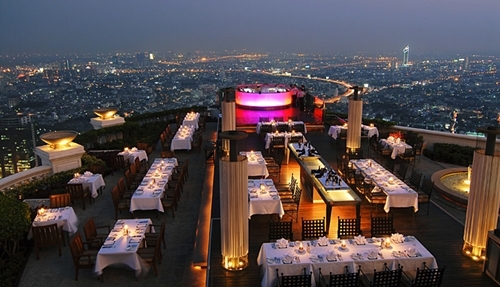 This restaurant offers the romantic view over the beloved Bangkok’s greenery Lumpini park. It combines an elegant indoor dining room with an open-air rooftop terrace lounge. You can either sit on comfortable soft stools or recline in a massive sofa and admire the views or enjoy the luxurious ambiance. The service is exceptional. Their superb cuisine created by the culinary team under the direction of award-wining Chef Paul Smart. Sirocco Restaurant: is the world’s highest all open-air restaurant and “Sky Bar”, located on the 64th floor of the State Tower on Silom road which is the second tallest building in Thailand. You can see the breathe taking panoramic view of Bangkok and the Chaopraya river from here. The food is mainly Mediterranean with ingredients flown in from the world’s best markets. Live jazz music featuring vocalists of international repute mingles with the fresh evening breeze, providing the perfect backdrop for a truly memorable evening with your special date. Honestly, this place is one of those places that you can have great experience, but you also pay for the view. On the first time I went to this restaurant with my friends, one of them wore ripped jeans so we were not allowed to enter. We went back another day with better outfit. Please note that smart casual attire is required. 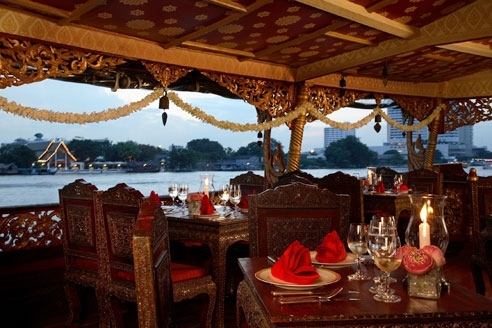 Chaopraya River dinner cruise: There are many hotels and companies providing dinner cruise along the Chaopraya river from the huge two-stories boats containing hundreds of cruisers with live music band to the beautifully refurbished rice barges. I have experienced both kinds of boats, so my personal liking is the smaller and quieter dinner cruise. It was much more delightful. I went with the Mandarin Oriental’s Maeyanang – a classic Northern-style teak-wood rice barge with carved wooden sculptures and tables to match. It provides seating for 32 guests in an open-air traditional setting. A four-course Thai set dinner served by the traditionally attired hostesses. Enjoying candle-lit romantic dinner while feeling the breeze along the River of Kings surely will be one of your wonderful memories, plus you will get to see the beautiful riverside landmarks such as Wat Arun, The Grand Palace, Bang Khun Prom Palace, etc. I also enjoyed the traditional Kim music (Thai xylophone) played gently in the background. Unfortunately, the Mandarin doesn’t have a dinner cruise available anymore, there are many similar cruises available such as Loy Nava, Manohra, Wanfah. Tip: For ladies, you might feel little bit chilly so it is good to bring a scarf with you. 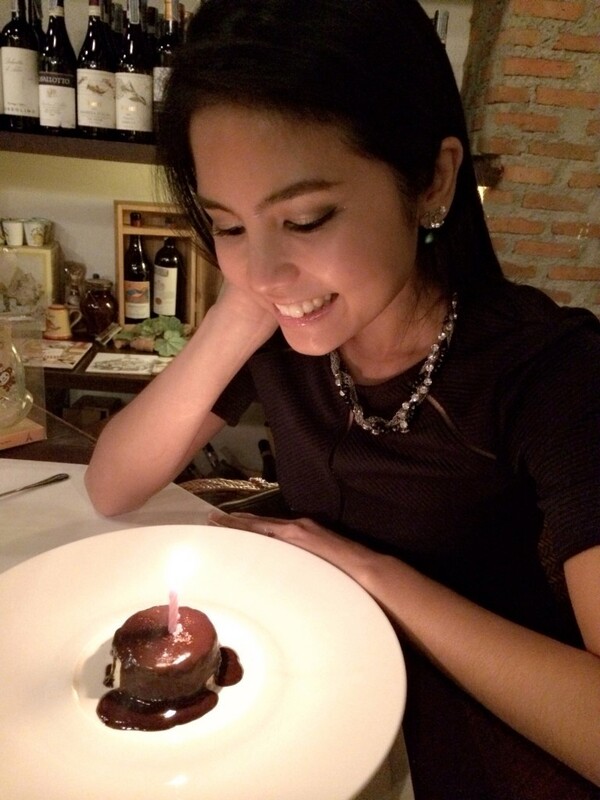 Zanotti: Here is my favorite Italian restaurant located in the quiet alley near Saladaeng BTS station; romantic and stylish ambiance, excellent authentic Italian food prepared with fresh ingredients, wine list is well prepared and considering high import taxes on wine, prices are reasonable. And of course the service is impeccable. I dislike a place with bad service no matter how good the food is, so this place fulfills all my requirements. Let me add my new favourite Italian restaurant to this list, I discovered this place on my birthday in 2013. 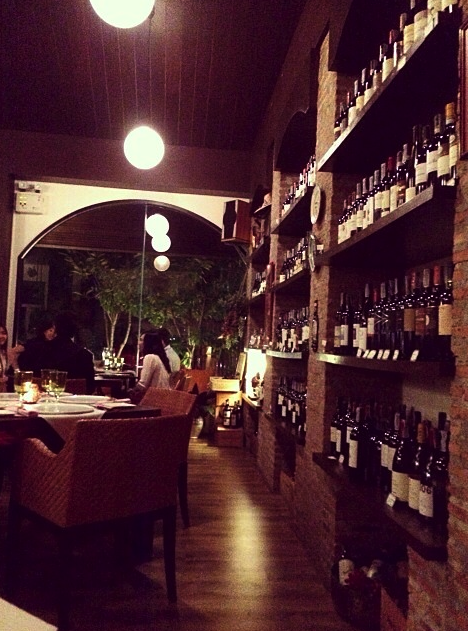 Enoteca Italiana is tucked away at the end of quiet Sukhumvit 27. On the way to the restaurant I thought ‘did I come to wrong street?’, there are just houses and pretty dark comparing to other sois in Sukhumvit. When I reached the white wall with lights, I was surprised to see that there was such a lovely gem hidden in this quiet corner. 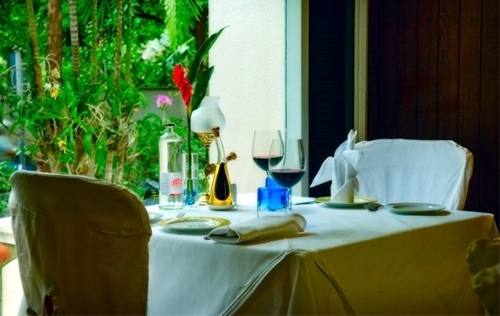 The restaurant is set in a one storey renovated house with a well-maintained lawn. I also like the fact that this place has high ceiling with floor-to-ceiling arched glass windows,and a polished wooden floor , it makes the place feel airy. They also put a wall of wines on one side of the barnlike room offering visitors more than 300 only Italian wine’s lables. What a charming little place! As for the food, the chef’s creation is pure magic. The restaurant offers dishes you won’t find elsewhere in the city ‒ not fusion, not pizza, but authentic traditional dishes. I still remember my first meal here, I ordered the 4 course degustation which all dishes were a surprise. They were Black Ink Cappuccino (I recommend! ), Ravioli filled with Foie Gras with Black Truffle, Salmon with artichokes and the dessert was Macadamia ice-cream with chocolate sauce. It was memorable dining experience. If you would like to have authentic Italian food in a romantic setting, this place is just perfect for you. Hope you find one of the places in my list interesting. Where is your favourite romantic place in Bangkok? I am happy to hear that you enjoyed Enoteca.I just discovered a new Italian in Narathiwas soi 7 called Sensi.If you would like to go for a good quality Italian next time,I recommend this place. Kru Mod, might I also recommend the restaurant Patara. Very nice setting for those who do not wish to climb high. I believe it is on Soi Thonglor. I highly recommend the 72 hr broiled lamb curry. I am a great fan of your videos. They are well presented. It makes me wish you were around when I was teaching myself some Thai from books and cassettes. About the restaurants…the ones on your website are mostly very expensive. Still, nice views and great food. I suppose, now that I think about it, you are correct. Many of the tastiest Thai and Chinese food restaurants in Bangkok are not very “romantic”. You must assume that food and romance together are mostly a farung thing. Over time that may change. 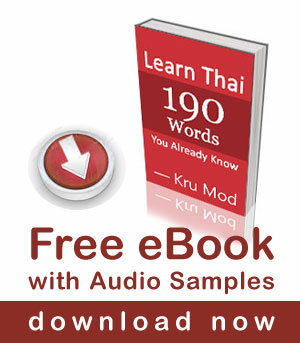 Thank you for your approach to teaching Thai using YouTube! River city….? Nice place to have BBQ…. I agree, La Nomandie is excellent for a special occasion. Vertigo is a bit touristy now. I have never been to D’sens and Smooth curry. Thank you for your suggestion. i have tried the one in the 61th floor(i hope i have not made the mistake)in banyan tree hotel on 2004. I found the korean tv team go to this one in one tv programme produced one year before. The scene is great but the food is very expensive. What? Not Vertigo? Or Naam? So many good places to choose from!